Point Park University sports, arts and entertainment management students and alumni met with more than 80 industry professionals and performers at the 2016 Association of Performing Arts Presenters Conference in New York City Jan. 14-19, 2016. "The conference brings in thousands of booking agents, artists, artist managers, presenters and other industry professionals connected to Broadway, celebrities, concerts, dance, theatre, classical music, pop/rock, jazz, variety acts and much more," explained SAEM Assistant Professor David Rowell, M.F.A., who accompanied the Point Park students and alumni on the conference trip. "Having Professor Rowell with us at the conference was invaluable. 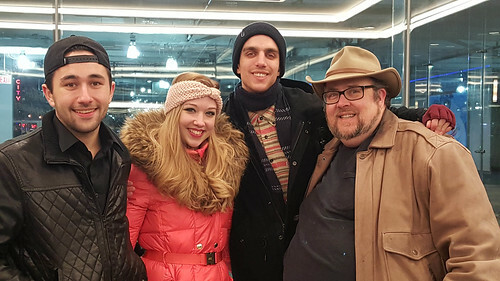 His personal connections with professionals in the performing arts industry meant we were given the opportunity to really connect with these people and have some incredible contacts moving forward," said Jonathan Guest, senior SAEM student. Rowell also served as a moderator and panelist at the conference, discussing the topic "Social and Mobile Marketing Trends Today" alongside David Dombrosky, chief marketing office of InstantEncore, and Bruce Garfield, owner of MonsterWorks Management and Marketing. In addition to networking with dozens of professionals and volunteering with various events at the conference, the SAEM students and alumni attended the Pennsylvania Presenters consortium meeting as well as numerous professional development sessions and performance showcases featuring artists from around the world. "Having the opportunity to not only meet and talk with professionals in the industry but also observe them in their working environments really solidified my career path in this field," remarked Jocelyn Hyrb, a junior SAEM major. "I realized that this is the industry I belong in and that being an arts presenter is absolutely what I will pursue," she added. For Hyrb, attending the APAP conference has been the highlight of her college career so far. "By the end of the conference, I had multiple offers for internships this summer," she said.